This genuine cowhide leather purse has a manmade trim and a front faux buckle and silver-tone loop accent. 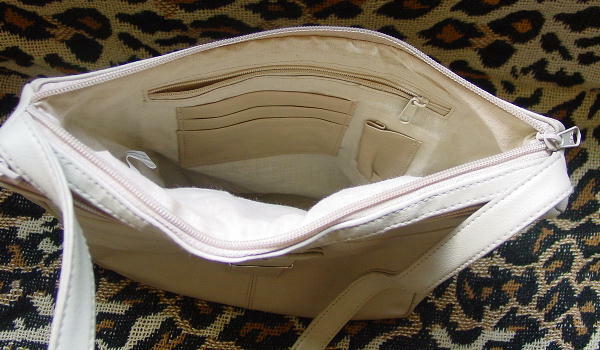 It has two side to side top zippers and two sections lined in a bone fabric. The back section has an interior zippered pocket, 3 card slots, and a pen holder. 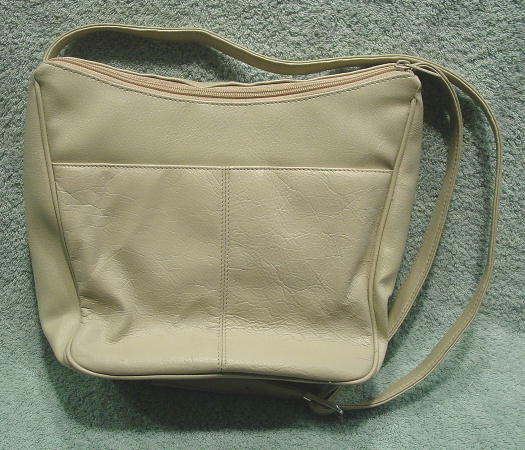 It has a 45" long by 3/4" wide adjustable shoulder strap with a silver-tone buckle and prong. It's in a bone-cement color and doesn't have the yellowish-cream color that it appears to in the pictures. It belonged to a former model.